Because of the length of this product review will be a multi-part post. Pt. 1 features brushes for the eyes. The review most of ya'll have been waiting for... brushes from Crown Brush. Yes, I know I took insanely long in writing this review (and thank you for being patient), but I had to really test these brushes out to make sure it's just not "love at first sight." I also took some comparison photos of it's length and the brush heads of the Crown Brushes next to the other brush brands that I own which has similar uses to it, so you can get a better idea how long these brushes are. Because of the ridiculous amount of brushes that I own, I've only picked a few of them to go side-by-side with my Crown Brushes, but I definitely included any MAC brushes that I own in the mix that has similar use to the Crown Brushes mentioned. If I didn't mention a brush in this review and you're curious and interested about it, leave a comment or e-mail me and I'll try to answer any question you may have about it. Prior to using these brushes, I've washed them with baby shampoo and luke warm water. Even if my new brushes are sealed and packaged, I still make the habit of washing them before using them. Packaging doesn't necessarily mean its sanitary. You don't know where it's been regardless of the brand. Washing your brushes is definitely crucial if the brush is not packaged wrapped since people do play with them, and you don't know where they've swiped or dropped the brushes, let alone where there hands have been. So just a smart tip: ALWAYS wash your brushes before using it. Anyway, as I was washing these brushes, I have experience minimal to no shedding. The brush that probably shed the most was the stippling brush that I bought (face brushes will be reviewed in Pt. 2 of this post) which is probably a few hair here and there. I also didn't experience any bleeding on any of the brushes. As far as the smell goes, the only thing I smelled was when I took the brushes out of their plastic packaging. It just had the new, "plasticky" smell that you usually get when you open a brand new item in a plastic packaging. I didn't smell any "wet-dog" smell or any pungent smell after washing both face and eye brushes. After I've washed my brushes, I just laid them all flat on top of a clean towel to dry. It probably took a few hours and not longer than a day for the brushes to dry. I've noticed that some of the natural bristles kinda flared out after it dried which kinda made the brushes "fatter" than I had it in the beginning. I'm not sure if it has to do with they type of shampoo I used since I used the generic baby shampoo from Target or it's just something normal. Some brushes came out not as super soft compared to when I initially got it, but they were still pretty soft and were not scratchy against my skin. Over time as I keep using these brushes, I found that some of the eye brushes tend to shed when I clean them by swiping brushes back and forth on a piece of papertowel using my MAC Brush Cleanser. It wasn't pieces of the bristles breaking off but the whole piece of hair coming out from the ferrule (metal part of the brush). I didn't really have this problem when I was washing them with baby shampoo and water, but I found that by swiping the brush in one direction and one side at a time also help prevent the problem. You just have to pretty much be gentle when cleaning them. I only had this problem with the C210 Round Contour Brush and the C222 Small Chisel Fluff. The length of both Crown Brushes are almost the same length of the Sonia Kashuk. It's also not that much shorter than the MAC brushes. The brushes seem to have the same density feeling across the board. 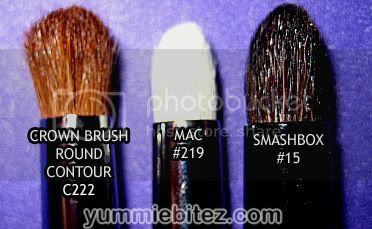 However, MAC 224 has a wider brush head compared to the to both Crown Brush. In my opinion, both Crown Brush are much softer than my MAC ones as my MAC one has become scratchy on my eye. Both Deluxe Crease from Crown Brush has made it easier for me to blend my eyeshadows especially when I use it for my crease. It also pick up enough color of eyeshadow from the pan. I find myself reaching for either one of my Crown Brush because it gives me a better result in blending my eyeshadows. Both C200 and IB119 are made out of natural hair bristles. 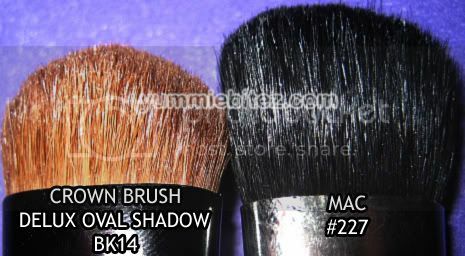 The Crown Brush BK14 is much denser and stiffer than the MAC 227. The Crown Brush is a great tool for highlighting the browbone and it's definitely a great alternative for the 227 which can cost you $30 for A BRUSH. However, the MAC 227 can be also used to highlight your cheeks since it's not as stiff as the BK14. But at the low price of the Crown Brush BK14, you can probably snag another brush that can highlight your cheeks and it'll still cost you less than purchasing the MAC 227. BK14 is also good for creating a smokey look. Pardon the dirty brushes :). But as you can see, I don't own the fluff brush from MAC. Why? Because I can't justify paying $22.50 for a single brush just to put eyeshadow on. I've used my Loew-Cornell Maxine Mop (painter's brushes found at Michael's) as an alternative instead. Although the Loew-Cornell are another great alternative, I sometimes find myself 'digging' through my eyeshadow pan when using this. It doesn't pick up color too well. However, with the Crown Brush C210, it picks up enough color with one swipe. Not to mention the Crown Brush are soft! The K6 firm shadow brush I found is better when used in applying mineral makeup or pigments since it's made out of synthetic hair. 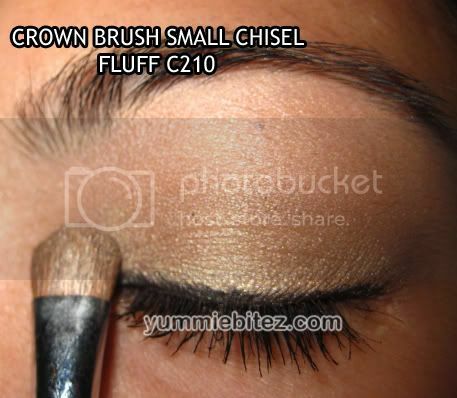 Here is a comparison of the C210 brush next to my eye. It's small enough for easy eyeshadow application on your lids. The Crown Brush C222 round contour were one of the brushes that flared after washing, but it didn't affect the quality of of the bristles. It was still soft. The brush head size is almost similar to the MAC 219 except it has a different use. MAC 219 is used as an eyeshadow liner for your upper or lower lashline because of its pointed tip while the Crown Brush is more for contouring your crease. The C222 brush, however, is a great brush to use when you're trying to add some depth in your crease since it's smaller in size than the crease brush mentioned above. 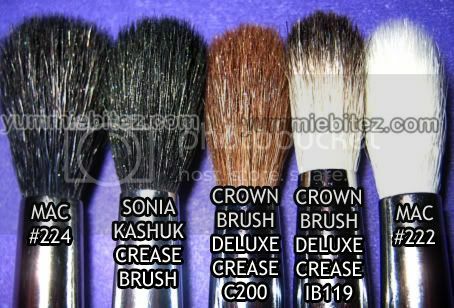 So those are only a few of the many brushes that you can get at a cheaper price at Crown Brush. These brushes are very affordable and good in quality. It's a great starter for beginners just experimenting with makeup or for the makeup addicts who are in search of inexpensive brushes does the good job. It's also a steal for professionals who are looking for good quality brushes without the high price. 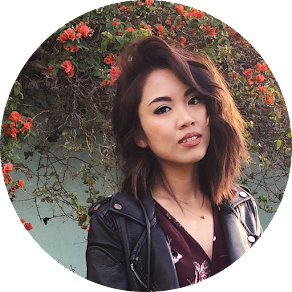 You really don't need to pay ridiculous amount of money to get a good brush (and why would you?). There are definitely alternatives out there available that are just as good or even better than the named brand ones. It's just a matter of knowing where to get them. thanks for this review! i'm getting every brush you mentioned, lol...plus more probably...i can't wait...you did an excellent job with this post, with comparisons, price, and description. thanks sweety! the brushes you mentioned that shed happens to me too haha. Thanks for this, its so helpful! very informative anne! thanks for this!!!! no matter how many times I've been using brushes, I would still love to read on their functions and I love reading that "WE DON'T have to buy expensive ones" thanks dear! hey anne, after i post up my swap list, my sister checked it and then she changed her mind about willing me to swap the pallete. she gave me some of her makeup to swap, and the pallete was one of hers. Im REALLY SORRY ABOUT THIS!!! I love your reviews! It's so thorough and detailed! Thank you so much for this review! I'm browsing their site right now!